Like I mentioned in my last post, this weekend I was busy bookbinding. Cutting paper, gluing, selecting paper, sewing, you name it. I had my tunes going on and I was having a wonderful time. I got 11 books done and have a few others in various states of progress. I’m calling this my keepsake book as the pockets are perfect for storing away ticket stubs, little photos, gift cards, and all sorts of ephemera. I do have some paper which I think will work perfectly for those ink stained pocket books so I’ll be making that one soon. And, in case you are wondering what happens when things don’t go according to plan… Well, that happens too. Sometimes I cut a board not quite straight, or I miscalculate how much decorative paper I’ll need. Usually though it’s the gluing that gets me. My husband laughs when I tell him I had a “bad glue day” but I swear they exist. A lot of times I can salvage a book but not this one. Just as I was gluing down the last pocket, I don’t know what happened but it didn’t quite align on the board. I tried pulling it off (as you can see here) but that didn’t help anyway because I had glued all the pockets and one pulled another and so on. Ah well, I did learn how to work around this the next time so at least there is that. Next up for my bookbinding adventure I want to use some gorgeous Japanese Chiyogami paper Christine sent me for my birthday. I already have a book structure in mind so let’s see how that goes. Ooh, the book with the desserts and all looks very lovely! You’re so talented, Iliana! And I’m sorry for the other book because it looks equally pretty too! I can see that will make a great birthday gift! Beautiful! What a fun hobby. You are so talented! I love the pink one, but have browsed your shop and they are all lovely! Your finished book is gorgeous! Too bad about the keepsake book but on the bright side you learned something that will help next time. Love the idea of library pockets! So sorry to see one of your wonderful journals meet such an awful demise. That chiyogami paper is gorgeous! I love the picture of the “bad glue” day! We all have those…don’t we…at least as a scrapbooker I do. Love what you do! Very nice. Can you still use the paper on the poor book on another book? Wow! The pocket books look really handy. I’m tempted. Stefanie – That’s what counts right? At least I learned something in the process and hopefully the next one will work out! 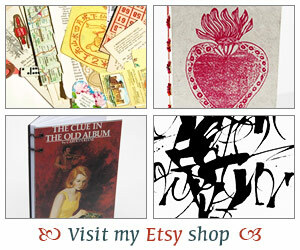 Tiffany – Bookbinding is definitely time consuming and can be quite hard. Don’t even get me started on leather books. Oh my goodness. But the finished project makes it all worthwhile! serena (savvy verse & wit) – Ha,ha.. so true! I don’t scrapbook anymore but I still drool over the scrapbooking magazines & the stores. 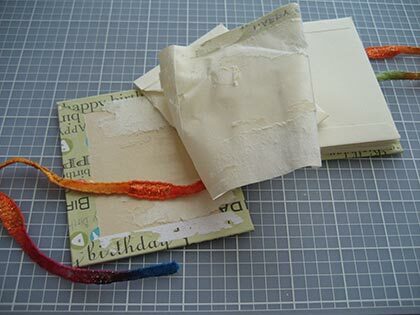 I love to use “scrapbooking” stuff in my books! Tara – Exactly! Lots of little things you can store in there and basically you can make it into a mini scrapbook! That’s lovely! Are you going to seel them? I love the pockets. I know all about making mistakes and having to rip them out and sometime you can mend them and sometimes Not! The problem with paper arts is wanting all the pretty papers for myself! Wow, you really have a talent for this! I love that you show how things go wrong, that’s what I like about writing, when things go wrong I hit delete and nobody ever has to know it was there!! I love your little notebooks, Iliana. Most recently I used one of the ones I bought to record patterns for drawing Zentangles. The Chinese paper is beautiful. Is that $9 for one sheet? Danielle – Thank you and yes I plan to add those to my shop. We’ll see how they do 🙂 I totally know what you mean about pretty papers. I have so many and some I wonder why I’m hanging on to for so long?! ha. Claire – Thank you girl. I definitely don’t mind sharing the “oops”. Plus, I love to show that even the books that might look simple aren’t necessarily so! Matthew – I love pink too! My dream is to have a pink bike one day but that’s for another blog post – ha. Girlfriend…you are too funny. I love your disaster shot. However, I love your new Keepsake Style a lot. I will have to order one soon. Keep an eye out. Thanks for sharing. the book is lovely.. the pink one! i wonder how u do it.. u really do a very good work! 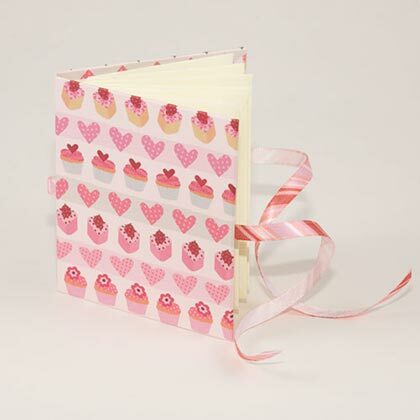 I love the idea of a keepsake book!